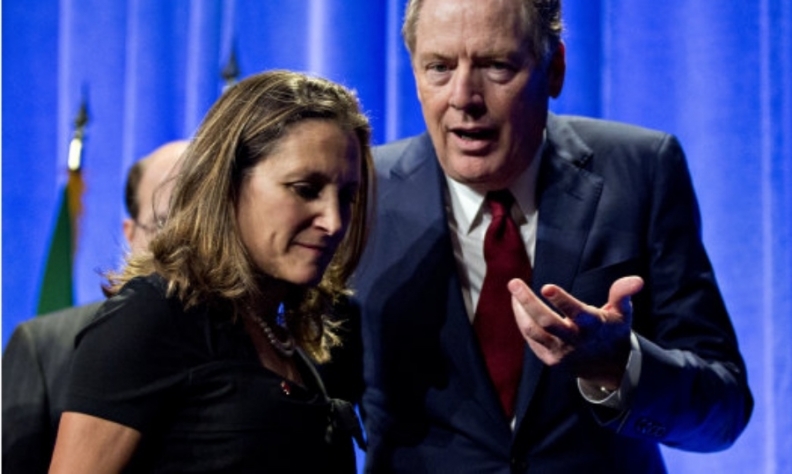 NAFTA pressure builds as foreign affairs minister heads to U.S.
WASHINGTON — Canada's foreign affairs minister is heading to Washington at a critical juncture in the NAFTA talks as the countries consider what a deal might include if there is to be one this spring. Several sources close to the talks say major decisions have yet to be made regarding not only the content of an agreement, but even the very structure of how it might be presented. Foreign Affairs Minister Chrystia Freeland is in Washington for meetings Thursday and could head down again next week amid a push to get an agreement in principle announced this spring, they said, speaking on condition of anonymity to discuss evolving plans that are not yet public. The parties clearly want something before the Mexican election — advisers to the poll-leading candidate there suggest that if an agreement came together before the July 1 vote, they would likely honour it. What's not yet clear is whether any imminent deal would be a full package to be presented to the three national legislatures for ratification, a preliminary announcement or a less-formal fix that would bypass the legislative process. The uncertainty was a recurring theme at an event Wednesday in Washington, where top experts on the U.S. congressional process ran through potential scenarios for pushing through a deal, including some that would be controversial. The speakers discussed one rumour rippling through the national capital: that a new agreement could include changes that don't require a vote in Congress, therefore skipping the months-long ratification procedure. The former chief international trade lawyer for the House of Representatives' relevant committee said she was shocked when she went back through the old NAFTA implementation law and discovered just how many powers American lawmakers handed the president in the 1994 legislation. She said the current law allows the president to change most of the important issues in the agreement, with notable exceptions like clothing apparel, the Chapter 19 system for punitive duties and perhaps government procurement. "You can say, 'What were we thinking in 1994?"' Viji Rangaswami, now vice-president at Liberty Mutual Insurance, told a gathering of the Washington International Trade Association. "If I were [lead U.S. trade official Robert] Lighthizer I would negotiate an agreement that didn't have to go back through Congress," Rangaswami said. "You change the auto rules of origin, you don't have to bring the agreement back through Congress. You change the labour chapter, the environmental chapter — none of those changes [need Congress]." The Canadian government had originally suggested such an approach in early 2017, hoping to avoid a complicated process, and kept stressing publicly how often the agreement had been tinkered with by executive order in the past. But significant changes via executive order could be highly controversial in Washington, since the U.S. Constitution grants lawmakers the power over international trade, a right they have delegated over time to the president. The Trump administration opted early on to proceed down the formal avenue for a full negotiation, although more recently it applied quicker fixes to the U.S.-South Korea agreement by executive action. Panellists at the Wednesday event referred to another rumoured scenario: The countries reaching an agreement that is less comprehensive than the U.S. lawmakers hoped for, but one they end up being threatened into ratifying. The threat in question would come from President Donald Trump — who could formally trigger the six-month cancellation clause under the old NAFTA, and force lawmakers to accept the new deal or have none at all. There are already signs of concern from American lawmakers that they might be disappointed by omissions in the deal, with different legislators writing letters in recent days to Lighthizer about dairy and intellectual property. A former chief lawyer to the Senate trade committee said he would like to see lawmakers stand up for themselves — and protect their constitutional rights by passing a law rejecting any presidential NAFTA withdrawal. "I don't think Congress should allow itself to be blackmailed in this way," Brian Pomper told the WITA event Wednesday. The complication of getting a deal ratified soon is intensified by the months-long procedures for a trade vote, and some analysts believe it's already too late to get a vote under the current Republican-led Congress, which is up for re-election in November. Hence the third possible option: a pause in negotiations. Canadian trade expert Laura Dawson says that's the only other scenario she sees — some announcement in the coming weeks of what's been agreed to, followed by a delay. She describes all three options as non-conventional scenarios. But Dawson said there simply isn't enough time to complete a thorough renegotiation this spring that performs a wall-to-wall upgrade on all the topics under discussion, something she said would require another nine or 10 months. She said all three countries want an agreement soon and are working in good faith, including Canada, which, unlike the others faces no federal election this year, but is suffering from trade-related economic uncertainty. "There is also pressure on Canada to get a good deal — but a deal swiftly," said Dawson, head of Washington's Wilson Center Canada Institute. "I think we're approaching a moment where all three countries are looking at [the non-conventional scenarios] seriously."